The food scene in Hanoi, Vietnam is one of the capital city's highlights; you'd be easily forgiven if you skip all the must-see sights in Hanoi in favor of hunkering down at any number of streetside stalls in the Old Quarter, eating your way through these northern Vietnamese favorites. As with beer, a certain regionalism prevails with Hanoi and food - the pho noodle dish is prepared differently between North and South, and the bowl of pho you get in the capital will be very different from that bowl you quaffed a few days back in Saigon. The dishes listed here are particularly Northern in character: it's commonly agreed that the best of each type can only be eaten north of the 17th Parallel, Hanoi in particular. It seems so simple and unadorned, but this hearty noodle dish has leapfrogged other more elaborate Vietnamese foods to the top of everybody's must-eat list. Pho is served everywhere in Hanoi, at all times of the day, mainly because it's so easy to make: all you need are rice noodles ("pho" actually refers to the type of noodle used; another noodle dish, "bun", is named after a type of rice vermicelli noodle), herbs, vegetables, and a choice of beef or chicken, all scalded in a meaty broth. It's cheap, too - a good hearty bowl should cost about $1-$2. The pho served in Hanoi answers to regional tastes and prejudices; after all, Hanoians proudly claim that pho was invented in the North. The serving style, for starters, is different: in the South, pho is served with the vegetables on the side, while in Hanoi and the North, the vegetables are already incorporated into the dish. This is the essence of pho bac, or pho from the north: pho made with unsweetened stock, the soup's aroma redolent with star anise and other more delicate spices. "Pho bac has an intense and delicate flavor that is entirely different from pho nam, which is pho of the south," writes entrepreneur and blogger Cuong Huynh. "The focus of pho bac is on the taste of its clear and simple broth." Northern pho, Huynh explains, is marked by simplicity and subtle layers of flavor: Northerners look askance at the garnishes favored by outsiders. "Even today, northern Vietnamese and pho purists consider pho bac the true pho," Huynh writes. "It is not uncommon to find a person from northern Vietnam or a pho purist to turn away from lavish preparations of pho nam or from pho that is not made from beef stock." First, let's deconstruct the name: "bun" refers to a thin, vermicelli rice noodle; the "cha" refers to the grilled pork meatballs that form the meaty component of the dish. When serving bun cha, the noodles, vegetables, nuoc cham (dipping sauce) and pork are served in separate plates or bowls, allowing each guest to pick and mix according to their personal taste. Cha gio (fried spring rolls) are an optional, but much-ordered, bun cha sidekick. Bun cha is another only-in-the-North dish that invites comparisons with the rival bun thit nuong, a similar dish served in the south. In Saigon, bun thit nuong comes with all the ingredients mixed together, including the sauce. And southerners disdain the use of cha, preferring to use thit nuong, or roast pork, in the dish. Finally, bun thit nuong can be eaten at any time of the day. In the North, Hanoians prefer to take their bun cha only during lunchtime. Come high noon in Hanoi, you can venture to particular corners of the Old Quarter to find a bun cha joint grilling merrily. A dish of bun cha costs around VND 20,000. This dish was recently brought to a wider audience by Anthony Bourdain and President Barack Obama, who met up for bun cha and beer at Bun Cha Huong Lien (see details below) in May 2016. This rice-flour pancake dish is a Northern Vietnam specialty, a savory rice-batter crepe filled with cloud-ear mushrooms, minced pork, and chopped shallots. The crepe literally holds everything together: a light, moist envelope made from fermented rice-flour batter, steamed to a semi-gelatinous state, filled and served with a dipping sauce made from fish sauce (nuoc mam) and a few drops of essence derived from ca cuong, a giant water bug! Banh cuon was literally invented in Hanoi, and may be older as the city (founded in 1010 AD). Thanh Tri District on the city’s southeast quarter lays claim to be this food’s place of origin, and to this day has the largest number of famous banh cuon places. 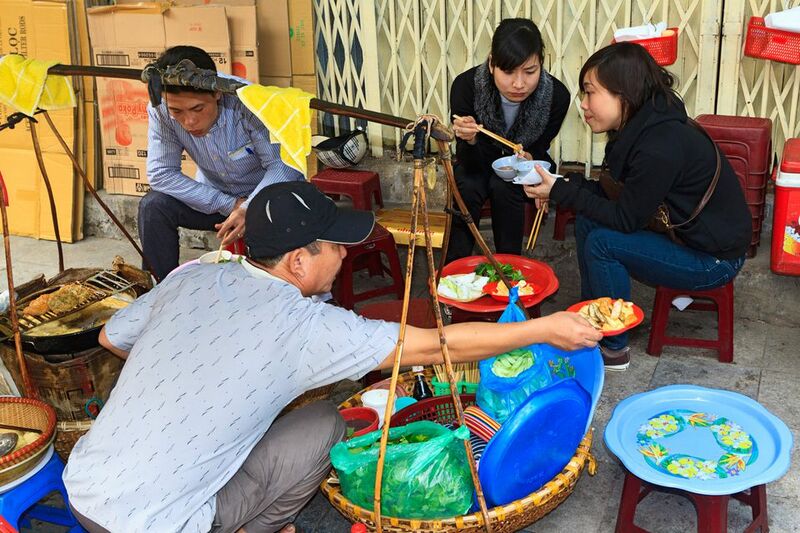 At any of these Hanoi banh cuon joints, you’ll get three different plates (each one containing a pile of rolls; spicy cha lua, or Vietnamese pork sausage; and vegetables) together with a bowl filled with the dipping sauce. While it’s a classic Hanoi breakfast, you can eat it any time of the day – a light repast ideal for that mid-Old Quarter shopping break! Unlike pho and bun cha, this dish has no natural counterpart in the south - cha ca la vong is proudly homegrown by Hanoians, the brainchild of the Doan family, who continue to make it in a restaurant that serves only that one dish. The cha ca la vong experience is more theatrical than most other culinary treats in Hanoi. In cha ca la vong restaurants (there are more than one; in imitation-happy Hanoi, plenty of other copycats have followed in the Doans' footsteps), guests sit at tables equipped with gas or charcoal burners. Marinated fish (preferably snakehead) are cooked right in front of the guests, first browned in oil, then enhanced with ginger, dill, green onions, and other herbs. The finished dish is served alongside rice noodles, coriander, fennel, peanuts, leeks, chili, and shrimp paste. The original Cha Ca La Vong restaurant is still the best place to experience this fish and veg concoction; the interior is shabby and the servers are snippy with the guests, but it's all part of the show. Eat it while it's hot.